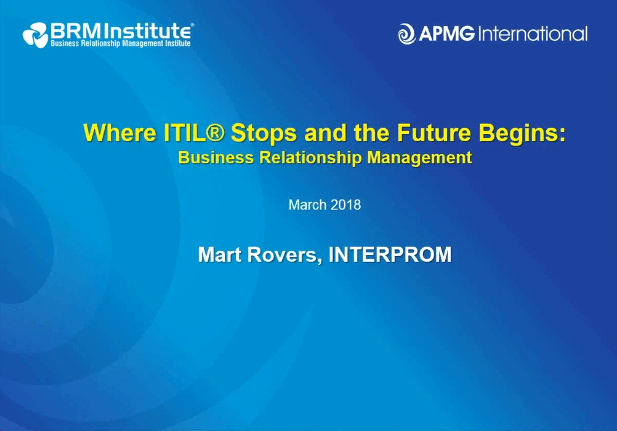 On March 22nd, 2018, I had the pleasure to present on behalf of APMG International and with Ronn Faigen a webinar titled: “Where ITIL Stops and the Future Begins: Business Relationship Management”. When you click on the image, you will be forwarded to APMG’s website and you will be able to listen to the webinar as well as to download the presentation slide deck. The webinar takes the listeners on a journey starting in 1990 when the first publications became available for the IT industry addressing the need for what we now call a business relationship manager, or a BRM. What is interesting is to see how the role of the BRM as well as the business relationship management practice has evolved throughout the years. In the early days, the main focus was an operational one. These days, the emphasis has shifted towards the strategic importance of it and the strategic partnership it fulfils. What is even more noticeable is how popular and widespread adopted best practice frameworks and standards such as ITIL, COBIT and ISO/IEC 20000-1 initially, and in some cases still do, focus on aligning IT with the business. Alignment as in, the business sits in the driver’s seat and the IT, as well as the rest of the organization, including HR, Finance, Legal, simply has to be there for the business, follow their lead and align their strategy with the business strategy. This is now perceived as an outdated way forward and way of thinking and operating. The new mantra is convergence of the business with the rest of the organization, also referred to as the service providers in the organization (e.g. IT, HR, Finance, Legal, Procurement, etc.). With the launch of the BRM Institute in 2013, this new way of looking at the relationship between the business and the rest of the organization, or between the vendor or supplier and its customers, has enjoyed a healthy dose of attention from the industry. Major research firms and executive leadership communities and organizations are recognizing this need for a relationship that is strategic in nature, rather than operational or tactical. The BRM as a role plays an important part to makes this shift happen. The release of the ISO 44001 standard for business relationship management underscores this trend. And, with the increased notion that the “business is IT” as well as a system approach to management (see also ISO/IEC 20000) is what makes organizations successful, the time is right and the time is now to act. Organizations are recognizing the need for the BRM role and organizations rely more and more on partners that act with a strategic mindset rather than a “you vs. me” state of mind. While service management has served the market well for several decades, more is needed to change this mindset. For more than a decade, the answer has been right in front of us: Value Management. Practicing value management is what organizations have adopted that have been successful with making this shift. The VAL IT Framework 2.0 from the IT Governance Institute and that was released in 2008 has been there “up for grabs” all along. Now the BRM Institute is making a big push to provide guidance on applying the value management concepts from a business relationship management perspective. Enjoy this webinar and never hold back to contact me with follow up questions. I’m excited to see where the market is heading towards. It’s going to be great! Thank you for your time and I welcome your feedback.